She came into our lives as a welcome angel right after I'd finished my 9 week course of radiation for breast cancer. She's a smart and active girl who loves chewing her rubber Chuckit ball and loves chewing her Nylabone and hoards all of the bones. She's definitely the boss and keeps her younger brother, Logan, in line. She likes to run and play at the dog park and her short "chirps" when she runs after other dogs make her sound like a monkey. She loves her food, and spins in circles before settling down to eat her kibble. Jinju likes to sleep partway under our bed at night, and often gets herself wriggled nearly all the way under the bed during the night. She's a spunky and loving gal, and Rick and I love her to pieces! 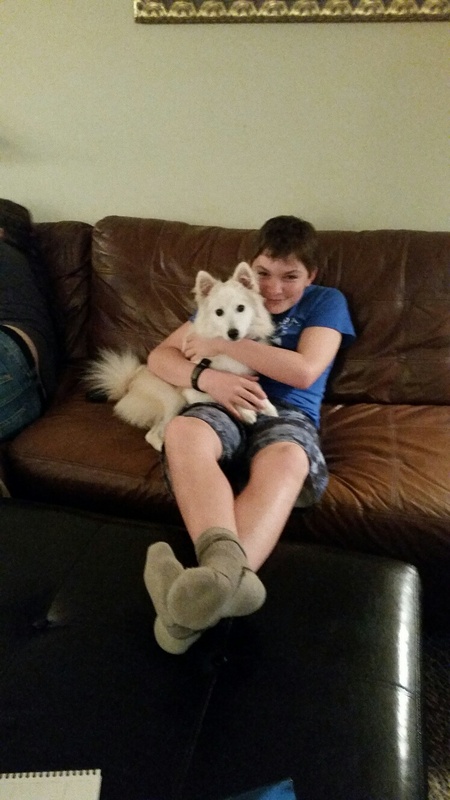 We are so lucky that we had the opportunity to adopt this beautiful Samoyed. My husband knew there was something special about this dog when we met her at her foster's house for the first time. She had only been in the USA for a couple of days. Although quite skittish upon meeting us, within a half hour she was playing with her toys and running around the backyard with such unbridled joy meanwhile having some curiosity about us. We were touched to see her enjoying life like this after learning that she had been in a puppy mill in Korea for two years and then dumped in a shelter and if not rescued would have been sent to the meat market. After meeting her briefly, she was sent to a trainer in San Francisco to help her integrate into life with people and learn basic dog training. At the time she had noise phobias and that was something he was also going to work with her on. We were interested to meet her again in a month to see how she progressed. After a month had passed, we offered to foster Keiko (formerly Elsa) hoping that we could adopt her. When my husband drove up to see her again and spend some time with her before taking her home, he said, she has been transformed and so much more confident, friendly, playful, and sweet. They went on a great hike together and she let him put her on his lap and pet her on her belly. She was even calm at the dog park and came to him when he called her. He was excited to bring her home! The big question was how she would get along with our 12 pound little dog Milo! We not only wanted a Samoyed for us but we really wanted him to have a buddy! with our first sammie puppy and the rest is history. My dogs have been obedience dogs and therapy dogs, as well as the loves of our life. This time we were hoping to adopt a puppy from Korea and then saw the pictures of Dylan the sick puppy at a vet in Korea that had been found on a pile of euthanized dogs, but because they thought he would just die on his own left him there to starve to death. We said we would take him and thought he was coming the middle of February but got an urgent call from Yvette saying he had to come in mid-January if he was to survive and so my husband, Tom, drove 1000 miles to LAX on a Friday and a 1000 miles back to Albuquerque on Saturday with Dylan. I first saw Whitney in a photo from Korea with another larger Samoyed on Facebook. I told Yvette I would take one. This was back in the very beginning about two and a half years ago. She was named Lilac and is the very first Korean dog to come to the US through Yvette's YNot Save a Sam group. Many kind donors helped out with expenses to bring her to our family. Lilac arrived at LAX. We were there holding signs for the gracious mother and son who couriered her from Korea. My hubby Roger wanted to get away from the crowds and traffic at LAX. So he proceeded to drive off with Lilac without taking her photo. This caused a lot of anxiety in poor Yvette who was worried and editing for news and photos of our first Korean Sam. We all got home safe and got some photos of the happy arrival. We decided to rename her Whitney. Buddy was found by Yvette in a shelter in Arizona. he was fostered by the wonderful rescuer, Kim Handsaker and her family. After she got him through Desert Tick fever and mammary cancer, he moved to California to live with us. We became fast foster failures. Meet Shadow and Iggy, the two newest members of the Whitworth Family. We first met them when Yvette sent me pictures of two dogs in the Ulsan Pound in South Korea. They had both been there for over four months in tiny little cages and didn’t have much time left before being euthanized. I could not choose which would get to live and which would not, so we applied to adopt both. Two months later, the boys were on their way to Idaho! It took an unbelievable number of special people to coordinate this adoption, both in Korea and in the United States. We picked the boys up on April 6th and brought them home. I was concerned about them meeting our other dogs, but my concerns were unfounded. From day one, all of the dogs have gotten along just fine. Ghost came from a horrible situation in South Korea. His first stop was to a vet in CA where he had 2 teeth pulled. He then flew to Chicago Christmas Eve. CER the rescue he arrived at called me New Year’s Eve and asked if we could foster a little boy for them. We have only adopted but I was happy to help. I picked up Bo Bo to bring him home and decided he needed a name to fit him and his journey. An author friend of mine had written a story about a Navy Seal codename Ghost. He was a survivor and so was this boy. Of all the names I tried, he only responded to Ghost. Ghost has had lots struggles with his health since we got him. He followed me around and slept with me, his head on my pillow many nights. He didn't play and has no idea how to even be a dog. 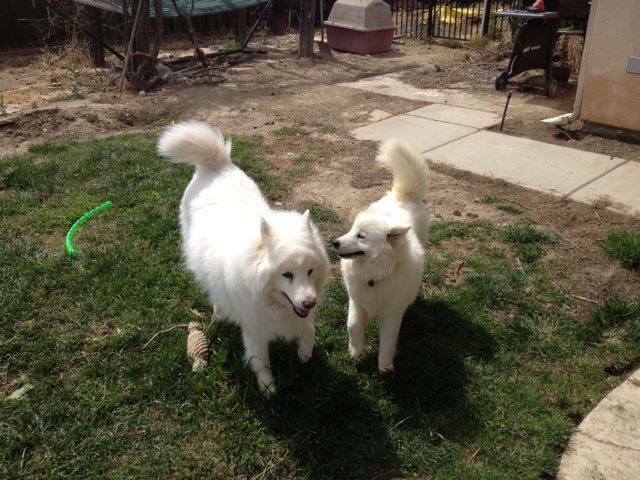 We have 2 American Eskimo dog boys that were very interested in teaching him how to do all the things dogs do. Ghost finally got a clean bill of health early May. We have work to do on his house training but he has blossomed into a delightful puppy. He loves chew toys, Nyla bones, raw hide bones and more. He would meet us at the door with the boys and bark. Today he started jumping up on the door and wow he is quite the jumper. I'm sure you are wondering does he have a forever home yet??? Absolutely!!! I am thrilled to say this soon to be 5 year old boy is our foster failure. When I was asked what I would like for Valentines Day I didn't hesitate, I wanted my boy Ghost. Thank you Yvette Nielsen and everyone involved in saving my wonderful unexpected addition. 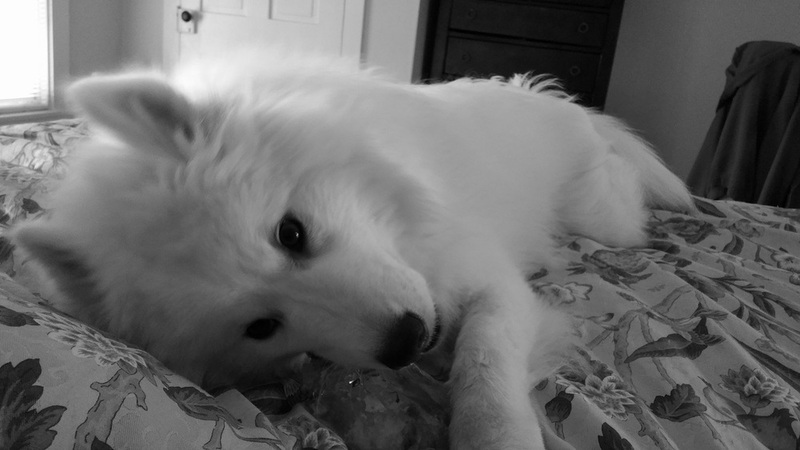 I have had the joy of having Samoyed’s most of my adult life. I fell in love with the breed years ago first by their beauty and that incredible “Sammy smile” and later with my first Sammy Misty, fell in love with her incredible demeanor and the unconditional love and kindness she possessed. After losing Misty, I decided to get a male and female so they would have a buddy. I lost my Bailey and Brandy over the last 2 years at 14 years and 15 years. They all were such wonderful angels on earth to me and it was extremely painful for me with each of their passing. I decided to bring small dogs into my life so found 2 West Highland Terriers, Dexter and Daisy. I love them too, but I still missed having a Sammy in my life. They are such kind, gentle, and loving dogs. 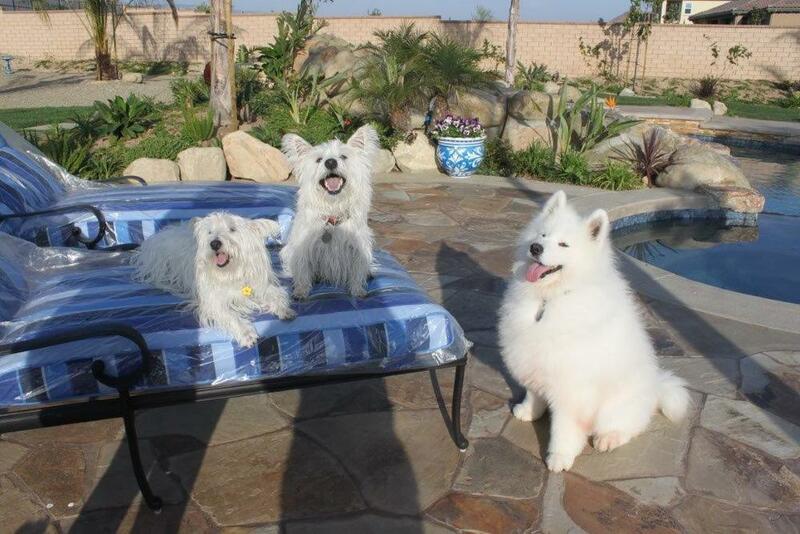 Last December I decided to try and contact the SCSR (Southern California Samoyed Rescue). Most of the rescue sites are outdated and I was skeptical that I would even get a call back. To my surprise I got a call back within the hour. 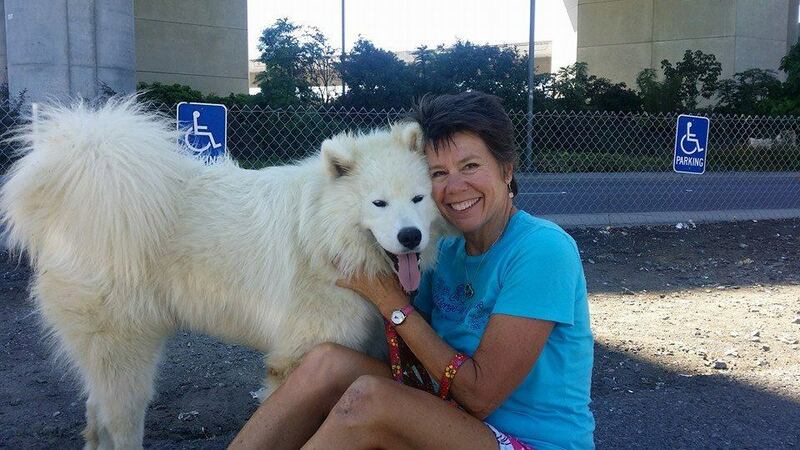 Marsha told me that it was rare that someone would turn in a Samoyed in So Cal but that they were doing some rescue work with Ynotsaveasam Rescue from Korea and were working on bringing 3 more to the US. She immediately got back to me with pictures and details. Christmas Eve Jordie (now Dakota) arrived at LAX. I was working with Karla on the adoption and when she, her husband and son pulled up to my house and I saw Dakota, I knew he was mine and my next angel on earth. Dakota has been with us for 5 months now and he is the sweetest, most gentle and loving dog I have ever had. For whatever horrors he had been through and was headed for he is such a joy. I am truly blessed to have him in my life. I want to commend all the volunteers both in the US and abroad that were involved in saving my Dakota and all the other rescues and heartwarming stores that have happened to date and continue to happen. I wish we could save them all! I am happy to say Dakota has put on 7 pounds since he arrived, his fur is growing back, and all the red discoloration is gone. He is so handsome! He loves to go for a walk and interact with everyone in the neighborhood. Everyone he comes into contact with loves him and they always say, I can’t believe he is a rescue, he is so beautiful. One of my biggest joys is watching how peaceful he sleeps and I truly believe he knows he is now safe, has a meal in his belly twice a day and is loved. 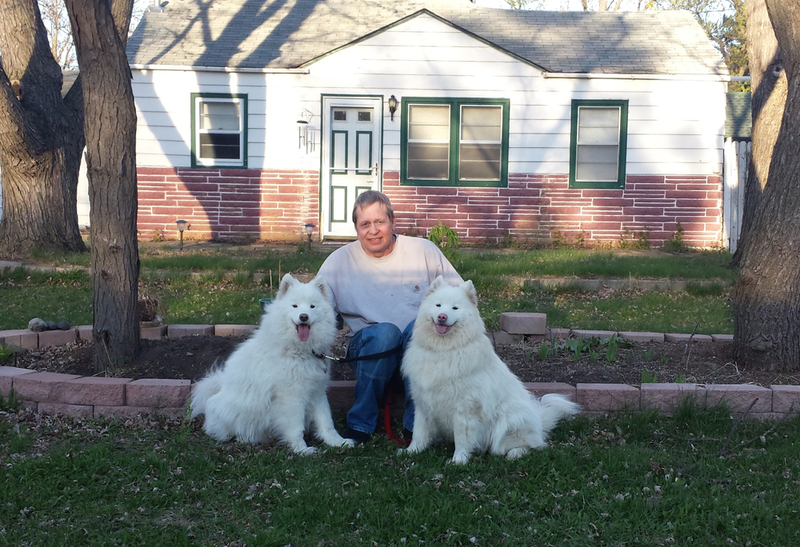 A former live-in boyfriend had two Samoyeds, which is how I fell in love with the breed. After he moved out, my house was so empty that I knew that it was time for me to get my own. I ran into a gal in town (Bend, Oregon) who told me about Yvette and her rescue work. A few months later, I drove down to SFO to pick up my darling boy; I will never forget the moment when I opened his crate door and our new life together began. Yes, he is still smothering me with kisses. Trek is a WonderDog. He is funny, he is a lovey-boy, he is playful, his coat was a mess (but we are learning together about brushing). Trek and I have truly become best friends — he hops into the drivers seat of my car when I leave him to go into a store. He loves riding in the car (since he’s not allowed on furniture at home, the back seat is his special sofa). My friends see me on the street with him, and they know it’s me, because they see Trek before they see me! Here is Gusty the first day we got him. He was the bundle of energy that you promised. I wanted a dog to pull me on my scooter and on my skis, he certainly was more than willing to do that. He filled out a lot once we'd had him for a while, and I liked to joke that we had adopted a tongue with some kind of white dog attached. When the weather cooled off I put him in harness with my husky mix and trained them to pull together. We entered our first race (a dry land event). Eventually moving on to skijoring. On the day this picture was taken, I ran both dogs about 9 km. At that point my husky mix was exhausted, and I dropped her off in the car while Gusty and I did another 6 or 7 km. The following year I ended up moving to South California. To my surprise, both dogs did pretty well in the relative heat. Vita (my husky cross) retired from mushing, but Gusty still pulls me about 6 or 7 miles every Saturday when the weather is cool. We have to do this very early in the morning before it heats up. A lot of rescues balked when I told them I was looking for a dog to play with, not just a companion animal. One husky rescue in particular told me to find a breeder and not adopt. That is very good advice for someone intent on winning races, but that never was my goal. I wanted a companion animal to play with, not an Iditarod champion. Having spent far more years around collies than sled dogs I still am taking aback when I watch my dogs play. Sled dogs look like they are attacking each other when they play – lips curled back to show vicious teeth and pink gums, growling, snarling, and barking. But they break it off instantly if I call them over for a treat, and somehow they simply don't end up injuring each other. Sammies seem to have a very wide range of what is normal, in terms of energy. Some seem to really like a quiet long cuddle; others seem to be unable to sit still for very long. Most folks want quieter dogs, but I like very energetic dogs that can run and run and run. There are a few consistencies with the breed; everyone owning a Samoyed realizes that Samoyed fur is both a covering for a dog, a fashion statement for humans who wear dark clothing, part of normal decorating (in dust bunny form), and a spice that seems to find its way into food. I guess my advice to someone considering adopting a dog is to think about what you want in a dog. How much energy do you really want? A dog that will run for 16 km in a day is not likely to want to curl up on the couch and watch movies with you all day. If you want a long haired dog like a Sammie, are you really going to groom him every week? Are you okay with dust bunnies … every Sammie home has them. I've had 2 Sammies thus far. Both have been stubborn, willful, and not particularly biddable. Each has at some point or another ended up off leash unexpectedly and has chosen to not run away. 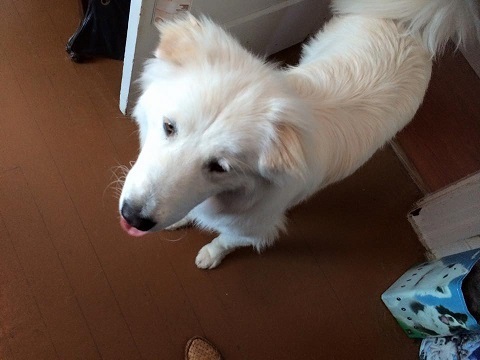 I found you when I was looking to adopt a Sammie and my local Samoyed rescue just didn't have a suitable dog. You shipped Gusty half way across the country … now he has been part of my family for several years, and we have moved from being 1500 miles east of you to being hundreds of miles west of you. Gusty has improved the lives of everyone he's touched. Thank you for connecting us. I’m sure that everyone has heard the saying, “When God closes a door, He opens a window”. This is exactly what happened for us last year. 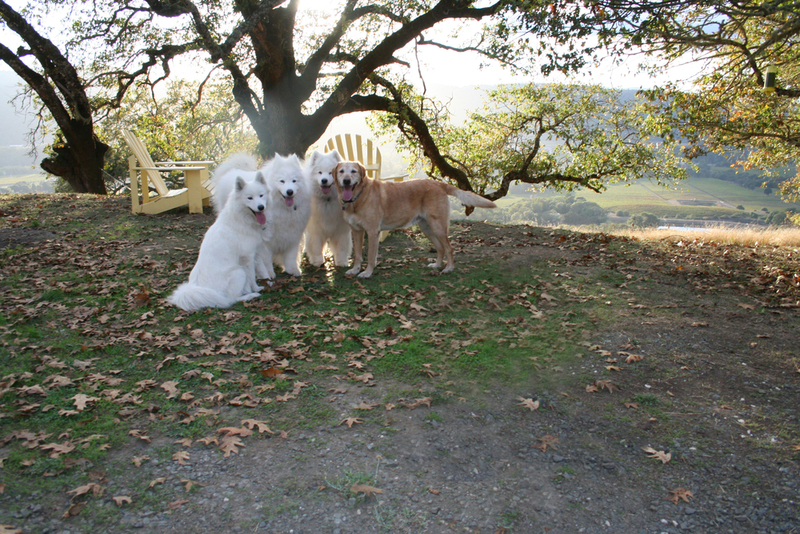 Sadly, we lost our Samoyed Kai to brain cancer. Although devastated, we were put into contact with Yvette and the story goes from there. We adopted Kuma and Kili through her Korea connections last July. I have to admit that it was not easy joining these two rambunctious, naughty, playful, no manners, loud, silly, stinky, crazy, lovable, cuddly, kissable, beautiful heart tugging kids. Yes, it was a challenge, but what little furry monster isn’t? They had a few issues to overcome but once they did, words cannot describe how beautiful and affectionate they’ve become. We love them unconditionally and we are one big happy family! Oh, did I mention Lucky, the senior Sammie? We were just giving him a transport from one town to another…guess who lives with us, too? Nothing will ever come between us, well for Kili-maybe a snack, Kuma-a toy, and Lucky-a kiss and FOOD!! They mean more than the world to us! Thanks Yvette for all that you do! Your efforts have fulfilled our hearts once more! --John & Vicki and the furry gang in Tahoe! It wasn't long after meeting Sissy for the first time that we knew she was going to have a permanent place in our hearts and in our home! After meeting Sissy and her wonderful foster mom at the dog park, we requested a home visit to see how our current puppy, 3 year old Great Pyrenees Louie would do having to share his bones, toys and affection with another dog. They got along so well that we knew we couldn't live without her! It’s only been about 6 weeks since Sissy joined our family but she is fast becoming used to her new 1.5 acre backyard, a million squirrels to chase, spa days, going to college track meets, road trips and will be taking her first (we think) boat trip this summer. When we heard that we were getting Bjorn (Owen), we were so happy! Our 21 month old Samoyed female, Asta, wanted a buddy and from pictures we had seen of Bjorn we could tell that he would be good with other dogs (plus, we loved his one ear down and one ear up). We were hoping to get a younger dog so that the two dogs could be rambunctious together, and we still are not sure how old Bjorn is, but the second that he and Asta first were in the backyard together, we were positive it was the right decision. Because Bjorn had recently been neutered, we waited until his stitches were out to let him run. And since he was still being treated for eye issues, the vet asked that we keep him wearing a cone for a few more weeks. But that didn’t stop Bjorn from running like crazy in the backyard with Asta, with the largest smile of joy we have ever seen on a dog! My husband and I had never lived with a dog, didn't know much about them, and didn't think we'd ever own one. We both thought Samoyeds were beautiful so I gave him a big stuffed one for our first Christmas and we thought that was that. When our girls were almost grown, one of them started texting me "What's that breed of dog Dad likes? This woman I know has one!" She and a friend, who knew Yvette, were visiting the puppies and Yvette's latest rescue had taken to my daughter. It felt right, but I was nervous. Yvette suggested that we “try him out" for a few days and nights. He still had his original collar, and I learned the story of how he'd been abandoned and starved at less than a year old. Yvette had doubled his weight, socialized him and made sure he was caught up with his shots, etc. When we decided to adopt him she gave us his favorite toys and also met us at the vet to pay for his last round of shots and orient us to the experience. She has been very patient with all of our naiveté and questions. Our dog has terrible separation anxiety and sometimes we impose on her to babysit. She's always very kind about it and he LOVES any chance to see her and Russ and play with his sammy pack. 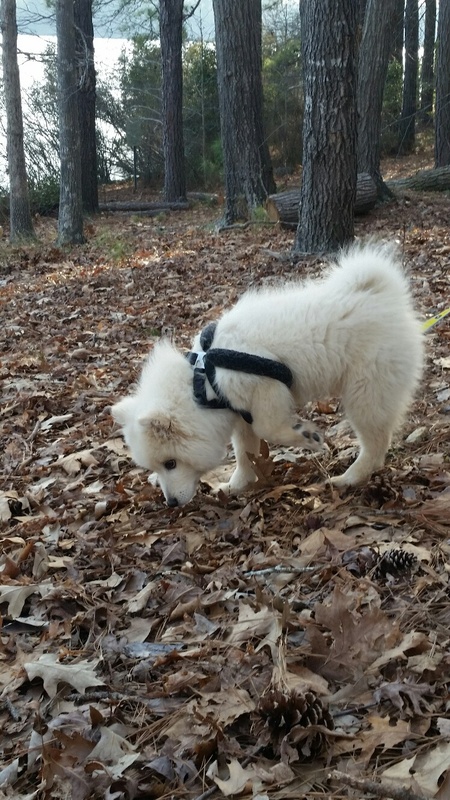 After adopting my first Samoyed, Pippa, and falling head over heels in love, I started doing research so that I could find another one to join my family. It was not that easy. I did not want to go to a breeder when I knew so many were being euthanized every year. The lovely person we adopted our female from put us in contact with Yvette. When I called her I told her I wanted to adopt a Samoyed in need...well I went to the right place. To be honest, I was quite overwhelmed with everything that was happening to dogs in Korea, but when I saw pictures and knew their fate I could no longer ignore the unsettling reality. I committed to take a large male Samoyed. The only thing that was important to me was getting him here safely. Yvette helped make that happen! He was severely abused and I knew he would not find a home easily if I did not take him. He did require a little more patience and TLC than most, but he is the most amazing and loving companion I could ever imagine! He is so smart and well behaved. He is loyal and loving and the best addition to our family. It breaks my heart that people hurt (eat!?) these beautiful creatures, but we can continue to help by rescuing more and spreading the word. Luca is an ambassador for his breed and dogs in general since he inspires me every day to help animals that are not as fortunate as him. Yvette's organization saves so many lives and I am so grateful for my Luca. --Gretchen G.